Reprinted here from Stained Glass in Catholic Philadelphia Saint Joseph’s University Press, 2002, Joseph K. Beyer contributing author. Paula Himmelsbach Balano (1877 -­‐1967) was born in Leipzig, Germany, and moved to Philadelphia at the age of two. She attended Drexel Institute and the Pennsylvania Academy of the Fine Arts. In 1899 she won the Academy’s Cresson Travelling Scholarship that enabled her to study in Paris under Alphonse Mucha. On returning to the United States, Balano continued her artistic training, first with Cecilia Beaux and later with William Merritt Chase. She supported herself as a portrait painter and teacher, serving on the faculty of the School of Design for Women (now Moore College of Art) from 1910 to 1934. Balano was already in her forties when she entered the stained glass profession. She first apprenticed with Nicola D’Ascenzo in Philadelphia. 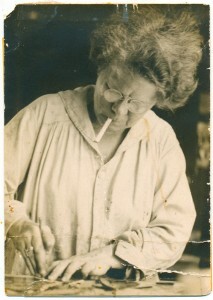 Several years later, in 1925, Balano opened her own studio in Germantown (Philadelphia). In 1928 she received her first major commission, for twenty-­‐nine stained glass windows in St. Stephens Church (Philadelphia). The church closed in 1993 and the windows were purchased by the Archdiocese of New York for adaptive reuse projects. Balano may have been the first independent women in the field at a time when all studio proprietors were men. She usually executed all of the work herself, from initial design to completed panel, receiving assistance only for the final stages of installation. Balano designed in the Neo-­‐Gothic style as did many of her contemporaries. Her work was included in the 1999 exhibit Philadelphia Stained Glass at the Paley Design Center of Philadelphia University (Curated by Joseph K. Beyer), and her windows can still be seen in at least four Archdiocesan churches. The small narthex windows in Visitation Church; the nave windows in Ascension of our Lord: St. Agnes Church, Westchester; and SS Cosmas and Damian, Conshohoken. When Balano signed her windows she used either her studio monogram or simply “P.H. Balano” and sometimes included the date. References: Dorothy Grafly, “Paula Himmelsbach Balano”, American German Review,October/November, 1955, Brothers/Rakow/Corning; Philadelphia Inquirer, 30 July 1999 ”Beloved Eccentric, Paula Himmelsbach Balano (1877 – 1967) First Lady of American Stained Glass.” Germantown Crier 50 (Spring 2000): 4 – 14.